Redox cycling of iron/iron oxide has many potential applications for gas-phase reactions and electrochemical devices, including intermediate temperature (550-800°C) iron-air batteries [1-2]. The major limitation to such technologies is the pulverization and sintering of the iron substrate with repeated phase transformation-induced volume changes and consequent mechanical stresses. To address this obstacle, we propose using freeze casting  as an economical and scalable route to fabricate highly porous iron scaffolds designed to withstand these cyclical stresses. The Dunand group has demonstrated successful freeze casting preparation of iron foams with highly elongated pores and bulk porosities greater than 80% [4-5]. By varying the freezing parameters we can tune the pore wall spacing and thickness, as well as the density of connection struts between the pore walls. With the ability to tailor these microstructures and experimentally cycle them through oxidation (to iron oxide) and reduction (again to metallic iron), we seek to optimize the structure for improved longevity in redox cycling. 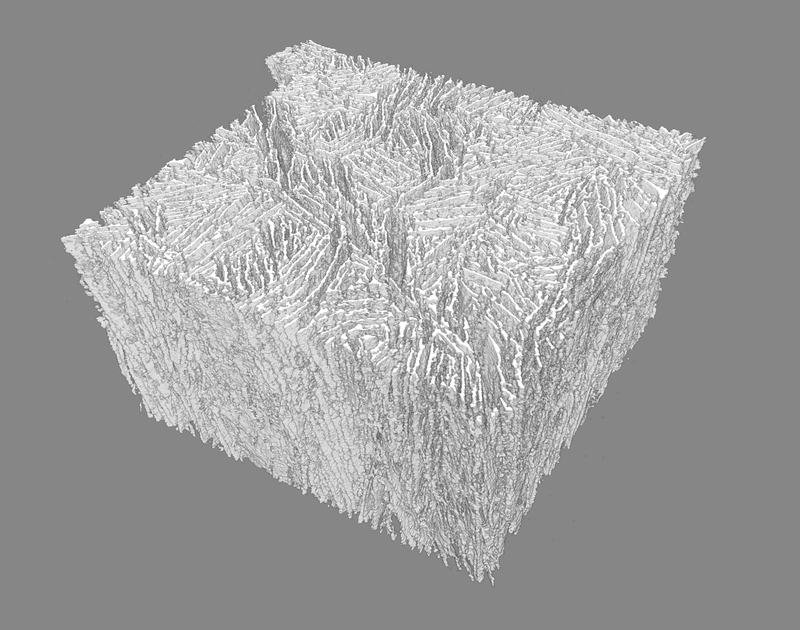 Our characterization techniques include metallography, SEM, and X-ray computed tomography. As part of this study, we plan to develop a finite element model to describe the phase change kinetics, volume change, and microstructural evolution in response to the induced stresses. Figure 1. 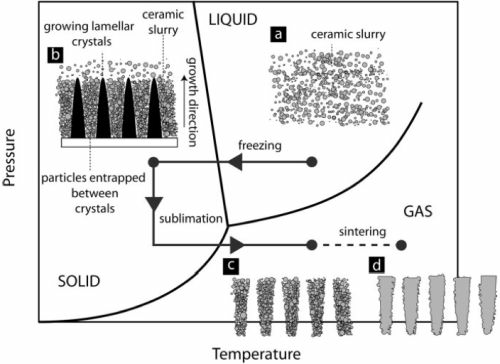 Phase diagram of water, showing the process steps of freeze casting . Figure 2. On left, optical microscopy cross-section perpendicular to the freezing direction; on right, SEM showing the microstructure of the iron lamellae..
C.M. Berger, et. al. Development of storage materials for high-temperature rechargeable oxide batteries, J. Energy Storage 1 (2015), 54–64. Q. Fang, C.M. Berger, N.H. Menzler, M. Bram, L. Blum. Electrochemical characterization of Fe-air rechargeable oxide battery in planar solid oxide cell stacks, J. Power Sources 336 (2016), 91–98. S. Deville. Freeze-casting of porous ceramics: A review of current achievements and issues, Adv. Eng. Mater. 10 (2008), 155-169. A.A. Plunk, D.C. Dunand. Iron foams created by directional freeze casting of iron oxide, reduction and sintering, Mater. Lett. 191 (2017), 112-115.